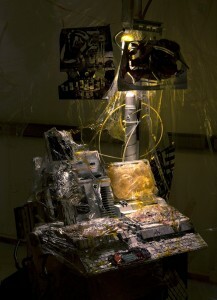 Sam Keogh opens an exhibition at the Kerlin Gallery titled Kapton Cadaverine this Friday from 6-8 pm. Keogh the will appear in conversation with ACW at Kerlin Gallery on Thursday 1 February, 5pm. This event is part of a collaboration with NCAD’s Master’s Program MA Art In The Contemporary World. In Sam Keogh’s Kapton Cadaverine, Kerlin Gallery is transformed into the interior of a dilapidated starship. The ship’s once-white control panels, table and bulkheads are covered in grime. Detritus litters the floor and strange organic forms and collaged images adorn almost every surface. Webs of melted plastic, stuck together with Kapton tape, cocoon the space in a mucosal membrane and the constant white noise of artificial rain underlines the eerie absence of an inhabitant.